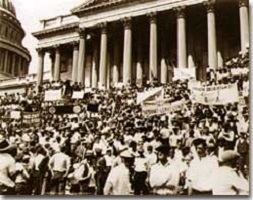 World War I veterans block the steps of the Capitol during the Bonus March, July 5, 1932. Many in America wondered if the nation would survive. In 1924, Congress rewarded veterans of World War I with certificates redeemable in 1945 for $1,000 each. By 1932, many of these former servicemen had lost their jobs and fortunes in the early days of the Depression. They asked Congress to redeem their Bonus certificates early. Led by Walter Waters of Oregon, the so-called Bonus Expeditionary Force set out for the nation's capital. Hitching rides, hopping trains, and hiking finally brought the Bonus Army, now 15,000 strong, into the capital in June 1932. Although President Hoover refused to address them, the veterans did find an audience with a congressional delegation. Soon a debate began in the Congress over whether to meet the demonstrators' demands. As deliberation continued on Capitol Hill, the Bonus Army built a shantytown across the Potomac River in Anacostia Flats. When the Senate rejected their demands on June 17, most of the veterans dejectedly returned home. But several thousand remained in the capital with their families. Many had nowhere else to go. The Bonus Army conducted itself with decorum and spent their vigil unarmed. Conditions during the Depression were so bad that some city governments devised programs that had the unemployed selling apples to make a living. 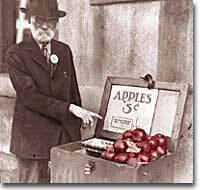 This man was one of nearly 700 apple vendors in Detroit. However, many believed them a threat to national security. On July 28, Washington police began to clear the demonstrators out of the capital. Two men were killed as tear gas and bayonets assailed the Bonus Marchers. Fearing rising disorder, Hoover ordered an army regiment into the city, under the leadership of General Douglas MacArthur. The army, complete with infantry, cavalry, and tanks, rolled into Anacostia Flats forcing the Bonus Army to flee. 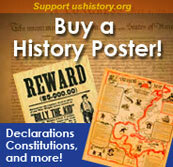 MacArthur then ordered the shanty settlements burned. Many Americans were outraged. How could the army treat veterans of the Great War with such disrespect? 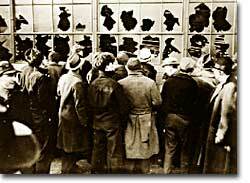 Hoover maintained that political agitators, anarchists, and communists dominated the mob. But facts contradict his claims. Nine out of ten Bonus Marchers were indeed veterans, and 20% were disabled. Despite the fact that the Bonus Army was the largest march on Washington up to that point in history, Hoover and MacArthur clearly overestimated the threat posed to national security. As Hoover campaigned for reelection that summer, his actions turned an already sour public opinion of him even further bottomward. America sank deeper in Depression. The communist-led unemployed councils were some of the most active groups in organizing the jobless during the Depression. Here in an audio clip as well as a transcription, a woman describes the circumstances which led her to become a social activist. Powerful. for the account of a relief worker in Long Island City. Eyes getting weary from too much reading? Then come click on this audio link, kick back, and listen to an unforgettable program on the Bonus March. The 2 months during which 10,000 veterans and their families set up a makeshift camp at the foot of the Capitol ended in one of history's biggest clashes between American citizens and government forces. This tightly-made program includes a link to vintage newsreel coverage of the event. Don't miss it! Even though the protesters who marched into Washington in May 1932 were veterans of World War I, Army Chief of Staff Douglas MacArthur insisted that the demonstration was actually a communist conspiracy against the U.S. government. This page, part of a larger website devoted to General MacArthur, summarizes the events of that tragic summer when the government turned on its own citizens. In January of 1937, hundreds of members of the then 2-year-old United Automobile Workers Union (UAW) carried out a successful sit-down strike at the General Motors factories in Flint, Michigan. Learn the story of a crucial moment in U.S. labor history and play a simulation of the strike through this New Vista High School website. Read a short account of the time between the House of Representatives's approval of the veteran's bonus legislation and the Senate's rejection of it. Picture police armed with rifles, Senators pontificating on a fabled protest of the Continental Congress 150 years before, and hungry, desperate marchers watching and waiting. The "doughboys" may have come home from World War I in 1918, but it wasn't until 1938 that Public Law 510 was passed, establishing November 11 as Armistice Day in honor of America's World War I veterans. For Buster Ratliff, a coal miner in Kentucky, the revival of the United Mine Workers of America in 1933 meant the end of "slavery."